UFC 215 lost its main event Thursday night when flyweight title challenger Ray Borg was forced out of the fight with a viral illness, delaying pound-for-pound king Demetrious Johnson’s bid for a record-breaking 11th title defense. 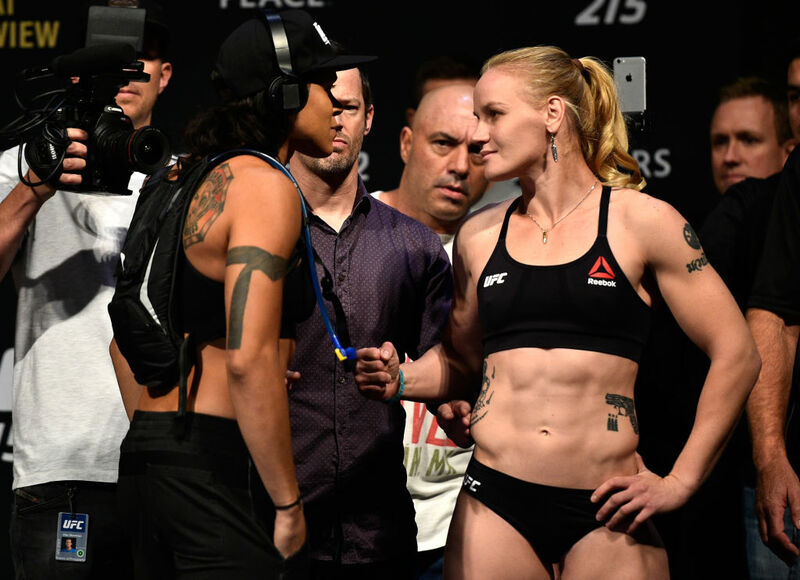 Fortunately, the second title fight on the card between women’s bantamweight champion Amanda Nunes and challenger Valentina Shevchenko is a compelling matchup in its own right, with both fighters’ names worthy of being draped across the marquee. In fact, some have hailed the bout as the biggest women’s mixed martial arts fight in history. “(This) is a fight between the two most skillful bantamweight fighters who have ever competed inside the Octagon in the women’s division,” UFC commentator Joe Rogan said. Nunes has been a ferocious champion. Her annihilation of longtime champion Ronda Rousey was quick and ruthless as “The Lioness” delivered bomb after bomb until Rousey couldn’t take anymore. But the champion’s momentum was stymied in July when she was forced to pull out of the originally scheduled rematch with Shevchenko at UFC 213 with a case of sinusitis. Nunes explained that her decision to not fight was based solely on not being 100 percent. With her belt and legacy on the line in the most high-stakes fight of her life, the Brazilian felt she had too much to lose. Now the fight is here and she’s ready to begin her redemption story for the fans who were disappointed she couldn’t fight last time. Shevchenko hasn’t forgotten what happened nor has she forgiven. “Bullet” was harsh in her reaction to Nunes’ decision, explaining that a champion must fight through everything to perform and compete. With wins over Holly Holm and Julianna Pena in her last two fights, Shevchenko has emerged as the most dangerous threat to Nunes’ championship reign. The Kyrgyzstan native lost by decision versus Nunes when the two fought in March 2016. As expected, Nunes started strong and controlled the fight for the first 10 minutes, securing a unanimous decision win to springboard herself to a title shot. Yet in the final round of their first fight, Shevchenko started to turn the momentum in her favor, landing shots and even a takedown against Nunes. With an extra two rounds in a championship fight at UFC 215, Shevchenko may have a better chance to beat Nunes, who has been criticized for her perceived penchant to fade later in fights. Nunes made the championship weight of 135 pounds with a smile on her face Friday ahead of the championship fight that can redeem her reputation and bolster her resume. With wins over Rousey and Miesha Tate already behind her, Nunes can become the greatest women’s bantamweight of all-time with a few more title defenses. She’s confident she’ll beat Shevchenko because the way she sees it, wherever the fight goes, she’ll be better. “The most important thing is getting this victory and keeping my belt,” Nunes said. “I think with Valentina, the other opponents fall into Valentina’s game plan. If you make Valentina fight in your game plan, that’s the big thing. You have to be smarter than her and I am. And she knows that I am. She knows I will beat her. I’m better than her everywhere and I will prove that Saturday.